I am just about finished with the paper piecing template for my pineapple wreath. I updated the bow a little to add another piece and make the bow bigger. 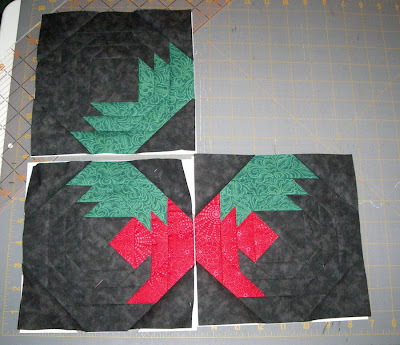 Again I'm using the red/green for the wreath on black background. I have 3 pieces finished and one to go. I like paper piecing however sometimes it gets confusing for me. I look at the patter and forget that the actual piece completed is the mirror image of the printed pattern. This is because the sewing is completed under the pattern. Because of this, I ended up making the same piece 3 times. Don't ask me how... That's what happens when you are distracted and really not concentrating. Now, I have two more repeat sections of the wreath than needed. Looks like I need to finish these and give two wreaths as Christmas gifts. Dont' forget to stop back for the pattern and instructions. I should have it published by Friday.